Frankly speaking, money has become the most important necessity of life. If you don’t have money, you won’t be able to buy food, clothing or shelter. In other words, your life will be miserable. People earning a decent amount of money will invest in a property, mutual funds or lend money on interest to increase their wealth. People unhappy with their salary or earnings will explore various ways to earn extra money online without spending a dime or switching the job. Unfortunately, the Internet is the only medium through which you can make money without investment. Before the smartphone revolution, people used computers to make money online. Now, you can earn money through mobile phone apps. If you own a car, you can easily make $1000 to $5000 every month by registering yourself as a driver on Uber and offering a taxi booking service to the commuters. Uber is the world’s largest ride-sharing service. It is an eight-year-old company that has reported a revenue of 3+ Billion dollars in 2017. Uber has a fleet of 30000+ drivers. It receives 100+ driver applications every day but only a handful of people are approved. You can become a Uber driver only if you have a clean record. 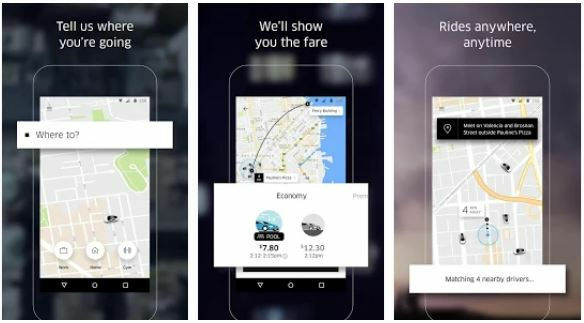 If Uber doesn’t accept your application, you can use the Uber alternative ride-sharing apps. Sell an item you’ve bought during a sale at a higher rate. Become a broker and contact people searching for a new home. Offer tuition class or any other service. Craigslist is a large site. 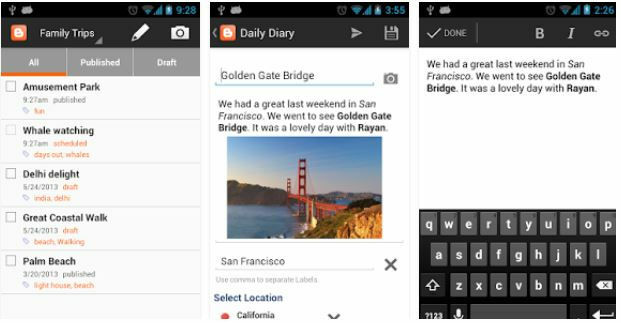 Its interface is simple and opens quickly in the mobile phone browser. 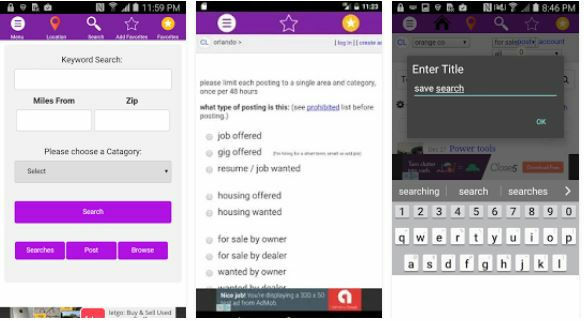 Craigslist hasn’t launched its official Android or iPhone app but there’s a free app called CL that allows users to go through the classified ads on Craigslist. Blogging platforms are of two types, hosted and self-hosted. Starting a blog on a hosted platform doesn’t require any investment. The top 2 hosted blogging platforms are WordPress and Blogger. Hosted WordPress sites display ads to make revenue for the parent company Auttomatic Inc. You don’t have control over these ads. Blogger is a free platform. If you want to launch a blog without spending money, you must use Blogger. Once your blog starts receiving a good amount of traffic, you can monetize it with AdSense or any other ad network. 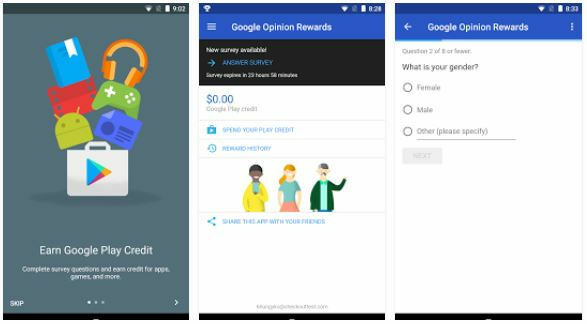 Google Opinion Rewards is an app through which you can earn free Google Play Credits. To earn credit, you must complete short surveys/answer basic questions. Before you start earning credits with this app, GOR will ask you to enter your email address, pin code, residential address, etc. Once you complete the profile, Google Play Credit will ask you a series of questions. The questions are short and accompanied with 4 to 6 options (answers). You must select the right answer. You can use the earned credits to buy paid Android apps, games, movies, or subscribe to the Google Play Music service. The free Opinion Rewards app displays a notification whenever a new survey is available. It will help you save money while shopping on the Google Play Store. The Fiverr app enables you to make money online from home by providing services to users. Services in this app are called Gigs. 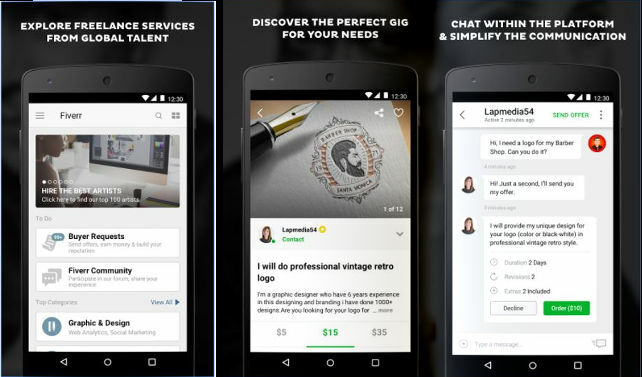 Fiverr allows you to set a price for the Gigs. The minimum price for which you can offer a service is $5. Cheap Gigs attract more buyers. Hence, people who offer cheap services on Fiverr have the potential to earn good money online. The app allows you to chat with buyers (customers). It has a rating and a review system. Satisfied customers will write a good testimonial about your work. Unhappy customers will leave a negative review on your profile. Once you establish yourself as a reliable freelancer or company, you can make a lot of money with Fiverr. Fiver has a large global audience. It enables you to publish a service in 115+ categories. 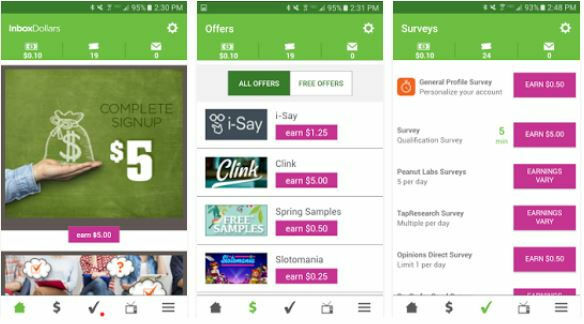 Inbox Dollars is an app that rewards money to users for taking surveys, watching videos, downloading apps, etc. You can withdraw money once you’ve earned $30. ID has an easy to navigate interface that displays a list of tasks you can complete to earn cash. InboxDollars credits your account with $5 as a signup bonus. Most users earn within $3 to $8 daily with this app. Hence, it can take 10 to 20 days to earn $30. InboxDollars is a legitimate app. If it was a scam, Google would not have allowed its owner to publish the app on the Play Store. 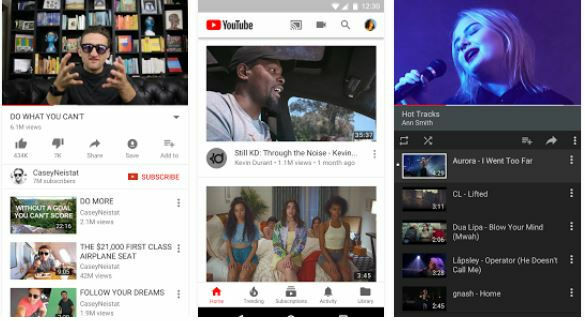 YouTube, the world’s largest video hosting site allows users to upload videos to their channel and monetize it with Ads. Your video must be unique to comply with the advertisement policy and get a good number of views. PewDiePie, owned by a Swedish VLogger Felix Kjellberg was the highest earning YouTube channel of 2016. Felix made a whopping $15 million from his PewDiePie channel. Felix uploads interesting videos to his channel every week. This has helped the channel amass 50 million subscribers. You can be the next YouTube millionaire. Although money can’t buy happiness, it is important for survival and living a good life. YouTube, Uber, InboxDollars, Fiverr, CraigsList, and Google Opinion Rewards are the best apps to make money online. The applications are free, legitimate and easy use to use. If you’re unemployed, become an Uber driver, start a YouTube channel or join Fiverr. Inbox dollars depends on your income. What you buy and have bought recently. If you are poor it will take a long time to earn points for cards. No cash or PayPal available. Store cards instead. Their surveys are income hounds. Wanting to know how and what you spend your money on. Often times they will not say anything at all. Rip offs.